Your new chance to pull the trigger on fun has arrived! 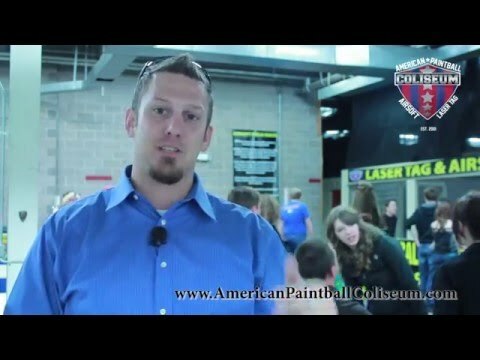 American Paintball Coliseum is open 7 days a week and is the #1 place to play paintball in Colorado Springs. Our paintball fields span across 13,000 square feet of astro-turfed playing space featuring boats, cars, planes, air-filled obstacles, and more! Our focus is to create the perfect blend of action, adrenaline, safety, and service for every occasion. Each game is a unique experience with an adrenaline rush that will keep you and your team hungry for more! Safety is our top priority and our staff are constantly watching to make sure everyone follows the house rules while having a great time. Our field supervisors are in charge of coordinating games and ensuring you are able to play just with your group if you prefer. Playing paintball is the perfect activity that allows birthday parties, bachelor parties, corporate events, or any other occasion to create memories that last a lifetime with the people that matter most. Book now and experience indoor paintball mayhem! Also known as speedball, our airball field is the perfect place to put paint down range! Airball fields feature a set of inflatable bunkers that are positioned symmetrically on both sides to allow for more sports-like gameplay. Use angles and positioning to gain an advantage to lead your team to victory! This is also the type of field where paintball tournaments and paintball tournament practice take place. A fan favorite! Scenario paintball fields at American Paintball Coliseum allow you to navigate an urban setting filled with boats, planes, hallways, barrels, and more! Keep your head low as you dodge and duck incoming fire all around you. With so many places to take cover, be sure to leave no area unchecked, you never know who has you in their sights! Work as a team to eliminate the opposition and raise your hand in victory on a field that’s fun for old and new players alike! 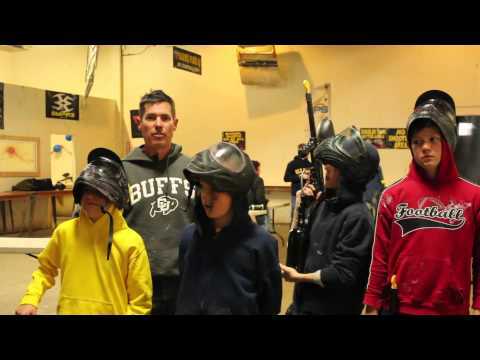 Book now and experience 13,000 feet of Colorado Springs Paintball Action! SHOULD I MAKE RESERVATIONS IF WE WANT TO COME PLAY? Yes, we do ask that reservations are placed at least 24 hours in advance in order to be prepared to serve your group as you arrive and to guarantee rental equipment for each player. We do accept walk on players, however rental equipment without a reservation is available on a first-come, first-serve basis. Reservations can be made here or by calling our Colorado Springs location at (719) 597-4796 and our friendly staff will be happy to help you. WHAT AGE IS PAINTBALL RECOMMENDED FOR? Paintball is a great activity for ages young and old. Generally, we recommend that players be at least 10 years old however younger players are allowed to play. WHAT SHOULD WE WEAR OUT TO PLAY PAINTBALL? Playing paintball can get a little bit messy, so it is best to come prepared to play in long sleeved clothing with a pair of closed toed shoes and a hat or hooded jacket. We do not provide any clothing for you, but do offer items for sale in our store that can help cover up clothes that you do not want to be hit. A change of clothes is also recommended in order to not track paintball goo into the car as you are finishing up your event. DOES THE PAINT WASH OUT OR ARE THE CLOTHES RUINED? The paint in paintballs is made out of food grade products meaning that it will wash out once you get home. We recommend to not let it sit for the best chance of avoiding stains. To be honest, sometimes. When getting hit with a paintball, there is a few seconds of stinging, but usually your adrenaline is going so you hardly feel it. Once again, it is recommended to wear long sleeves out to play to reduce the sting of getting hit. Getting hit may leave a nickel sized red welt on the skin that usually heals within a couple days. CAN PARENTS AND OTHERS WATCH THE KIDS PLAY? Of course! Our fields are set up to have a viewing area for spectators to watch games. Viewers may watch through the nets without needing to be a player themselves. DO YOU HAVE AN OUTDOOR FIELD IN COLORADO SPRINGS? 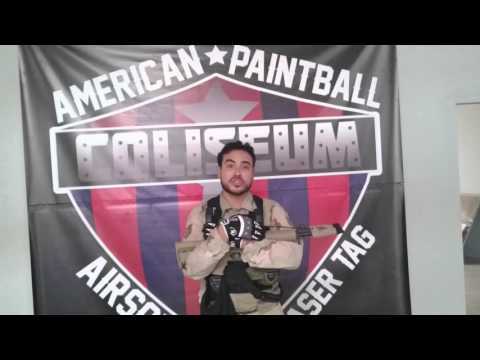 The only outdoor field for American Paintball Coliseum at this time is located in Brighton, Colorado. For more information about playing at our outdoor field, please contact our Denver location and they will be happy to answer any questions you may have. We do allow outside food or drink to be brought in and enjoyed. Unfortunately, we cannot allow any alcohol within the building. We do also offer a snack bar that has beverages and snacks and hot food for sale. Ask us about catering and other food options when making your party! HOW LONG IS THE AVERAGE STAY FOR A PAINTBALL PARTY? Most paintball parties stay for an average of about 2 hours. This is a good amount of time to stay for a fun experience and allows everyone plenty of opportunity to eat, play and socialize. There is no strict time limit on coming in to play paintball with the purchase of a standard entrance pass. You are welcome to bring in your own equipment, however all paintballs must be purchased through us. When bringing your own equipment, we will advise you on any questions that you may have and will be subject to chronographing your equipment before playing against other players to make sure everyone is safe. For more questions, you can always give us a call at (719) 597-4796. Want more info on paintball?